by Schmidtz, David; Shahar, Dan C.
Asking what really matters, the first section of the book explores the abstract ideas of human value and value in nature. The second section turns to the question of what really works--what it would take to solve our real-world environmental problems. 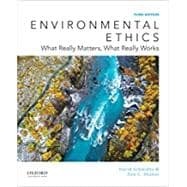 Moving beyond the "hype," it presents authoritative essays on applying environmental ethics to the issues that matter right now. The selections present philosophical, biological, and socially scientific approaches to the major issues. Environmental Ethics also features first-hand descriptions from people who have actually been involved in wildlife and conservation initiatives. David Schmidtz is Kendrick Professor of Philosophy and Eller Chair of Service-Dominant Logic at the University of Arizona. Dan C. Shahar is Research Assistant Professor of Philosophy, Politics, and Economics at the University of North Carolina at Chapel Hill. The late Elizabeth Willott was Principal Research Specialist in the School of Geography and Development at the University of Arizona. * Roderick Frazier Nash, "Old World Roots of Opinion"
* George Perkins Marsh, "Man and Nature"
* Ralph Waldo Emerson, "Nature"
* Gifford Pinchot, "The Principles of Conservation"
John Muir, "The Hetch Hetchy Valley"
* Gifford Pinchot, "The Hetch Hetchy Dam Site"
Aldo Leopold, "The Land Ethic"
* John Stuart Mill, "On Nature"
Lynn White Jr., "The Historical Roots of Our Ecological Crisis"
* Aldo Leopold, "Thinking Like a Mountain"
* Rachel Carson, "Silent Spring"
Garrett Hardin, "Living on a Lifeboat"
Gita Sen, "Women, Poverty, and Population: Issues for the Concerned Environmentalist"
Holmes Rolston III, "Feeding People versus Saving Nature"
Thomas E. Hill, Jr., "Ideals of Human Excellence and Preserving Natural Environments"
* Philip Cafaro, "Thoreau, Leopold, and Carson: Toward an Environmental Virtue Ethics"
* Thomas E. Hill, Jr., "Finding Value in Nature"
* Thomas Aquinas, "Whether It Is Unlawful to Kill Any Living Thing"
* Immanuel Kant, "Duties toward Animals"
* Jeremy Bentham, "Can They Suffer?" Peter Singer, "All Animals are Equal"
* Tom Regan, "The Case for Animal Rights"
* Bonnie Steinbock, "Speciesism and the Idea of Equality"
Mark Sagoff, "Animal Liberation and Environmental Ethics: Bad Marriage, Quick Divorce"
* Gregg Easterbrook, "A Moment on the Earth"
Paul Taylor, "The Ethics of Respect for Nature"
David Schmidtz, "Are All Species Equal?" Holmes Rolston III, "Value in Nature and the Nature of Value"
J. Baird Callicott, "Holistic Environmental Ethics and the Problem of Ecofascism"
For Discussion: How Wild Does Nature Have to Be? Martin Krieger, "What's Wrong with Plastic Trees?" David Pitcher and Jennifer Welchman, "Can an Environmental Paradise be Regained? The Hetch Hetchy Question"
Elizabeth Willott, "Restoring Nature, without Mosquitoes?" Arne Naess, "The Shallow and the Deep, Long-Range Ecology Movement: A Summary"
* Bill Devall and George Sessions, "Deep Ecology"
* Murray Bookchin, "Social Ecology versus Deep Ecology"
Ramachandra Guha, "Radical American Environmentalism and Wilderness Preservation: A Third World Critique"
David Schmidtz, "When Preservationism Doesn't Preserve"
Ian John Whyte, "The Elephant Management Dilemma"
* Ramachandra Guha, "Deep Ecology Revisited"
David Schmidtz, "Natural Enemies: An Anatomy of Environmental Conflict"
* Ted Nordhaus and Michael Shellenberger, "The Forest for the Trees"
Henry Shue, "Global Environment and International Inequality"
Daniel Silvermint, "Three Models of Oppression"
V. Rukmini Rao, "Women Farmers of India's Deccan Plateau: Ecofeminists Challenge World Elites"
Kristen Hessler and Elizabeth Willott, "Feminism and Ecofeminism"
Karen J. Warren, "The Power and Promise of Ecological Feminism"
David Schmidtz, "The Institution of Property"
Carol Rose, "Liberty, Property, and Environmentalism"
* Mark Pennington, "Liberty, Markets, and Environmental Values"
* J.H. Dales, "Simple Problems, Simple Solutions"
* Steven Kelman, "Cost-Benefit Analysis: An Ethical Critique"
David Schmidtz, "A Place for Cost-Benefit Analysis"
* Gary L. Francione and Anna E. Charlton, "Animal Rights: The Abolitionist Approach"
* Mark Bryant Budolfson, "Is It Wrong to Eat Meat from Factory Farms? If So, Why?" * Cora Diamond, "Eating Meat and Eating People"
Michael Pollan, "The (Agri)Cultural Contradictions of Obesity"
Paul Schwennesen, "On the Ethics of Ranching"
* Elliott Sober, "Philosophical Problems for Environmentalism"
* Bryan G. Norton, "Toward Unity among Environmentalists"
* Katie McShane, "Anthropocentrism vs. Nonanthropocentrism: Why Should We Care?" Lynn Scarlett, "Choices, Consequences, and Cooperative Conservation": A New Environmentalism? * Baylor L. Johnson, "Ethical Obligations in a Tragedy of the Commons"
* Ty Raterman, "Bearing the Weight of the World: On an Individual's Environmental Responsibility"
* Dan C. Shahar, "Treading Lightly on the Climate in a Problem-Ridden World"
Dale Jamieson, "Ethics, Public Policy, and Global Warming"
* Philip Kitcher, "The Climate Challenge"
* Darrel Moellendorf, "Justice in Climate Change Mitigation and Adaptation Policies"
* John Broome, "The Most Important Thing about Climate Change"
* Bjorn Lomborg, "Cool It"
* Adriana Zuniga-Teran, "Urban Ecology"
Lynn Scarlett, "Making Waste Management Pay"
Joshua Colt Gambrel & Philip Cafaro, "The Virtue of Simplicity"
Mark Sagoff, "Do We Consume Too Much?" Freya Mathews, "Letting the World Grow Old"
* Adriana Zuniga-Teran, "Walkable Neighborhoods"
Paul Watson, "Tora! Tora! Tora!" Kate Rawles, "The Missing Shade of Green"
Andrew Light, "Taking Environmental Ethics Public"